They say the best place to get a New York steak is in New York, and one of the best steak houses in New York is Rosie O’Grady’s at 800 7th Ave. Family-owned and operated for over 30 years, Rosie O’Grady’s is centrally located near Times Square, Rockefeller Center, the Jacob Javits Convention Center, and a short distance from several major museums. 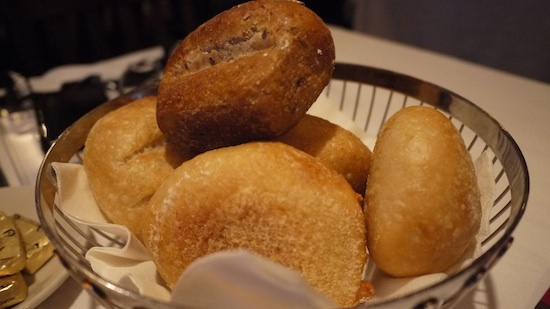 The restaurant has the look and feel of a classic New York steakhouse. The room features lots of deep colored wood, and the old bar is full of character. The place even has a sense of humor. 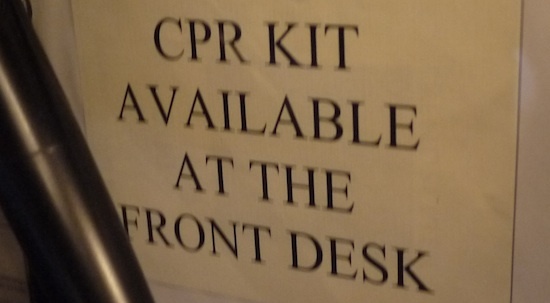 Right at the entrance, there’s a sign that tells you the CPR kit is available at the front desk. Hopefully, you won’t eat a steak big enough to use it. I went for the classic New York strip, grilled medium rare. It comes with a bake potato with sour cream and nothing else. 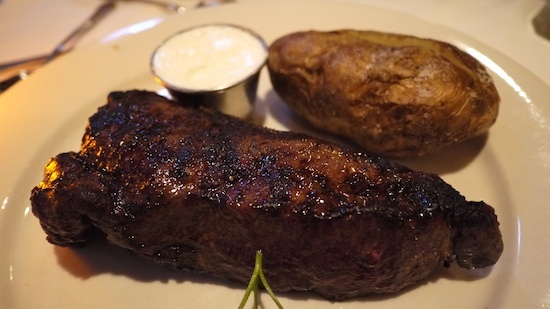 O’Grady’s steaks are served Ã€ la carte, meaning any sides are extra (except for the potato). I can see why there was a sign for a CPR kit after I saw the steak. The thing is huge! The menu said it was 14oz, but it looked much bigger than that. Consume the entire meal with the free bread, and you may need that CPR kit! The steak was grilled perfectly and was very juicy. It wasn’t the most tender or flavorful steak I’ve ever had. That honor still belongs to Gotham Steakhouse. However, steaks at Rosie doesn’t cost as much as the USDA Prime steaks at Gotham. In terms of value for money, Rosie O’Grady’s is pretty hard to beat.